Everything links to something else; that's the notion of a cycle. This is the cycle leading up to the back-to-back challenge of the state powerlifting meet on Saturday followed by an indoor track meet on Sunday. To be dead honest, I’m not entirely sure that I can pull this off, and I’m completely certain I will not be at my best on Sunday. Still, there’s not going to be another chance to spike up indoors this winter, so that’s the deal. The powerlifting cycle began weeks ago, and that’s in the hands of Coach Jeff. 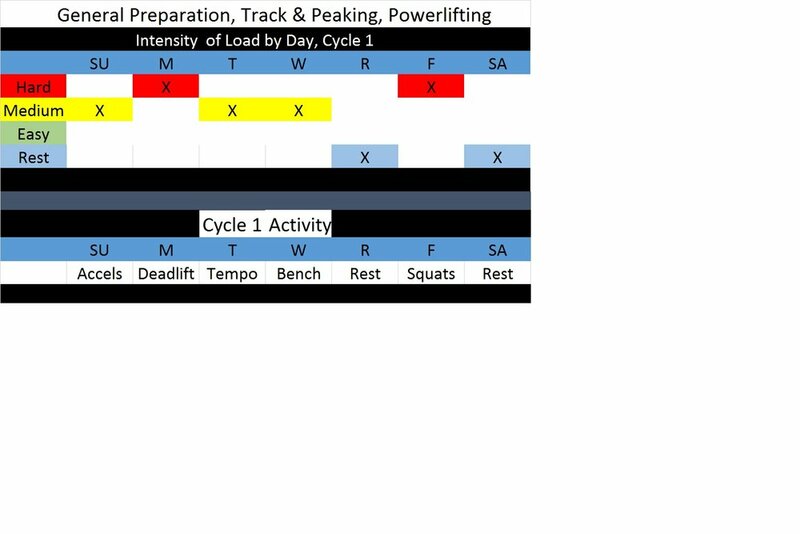 After the holiday break we will build up again over the six weeks to what I think will be (roughly) an ending week of preparation that sees a squat in the neighborhood of 300, a deadlift around 400, and a bench in the 230-240 range. I leave the programming on that up to Jeff. For track, I know that I am not going to be fresh for the meet, having just done the powerlifting meet. I have to decide if I’m doubling the 60/200, or if I’m doing one of those and shot putting. I really need to throw to have a better idea of that, but the weather is not cooperating right now. If it warms up next week, I can get a few throw sessions in before I have to decide. Right now, though, I’m preparing as if it’s all about the sprints. The basic principle I am following is this: the stronger I am, the faster I get. Observationally, the thing that gets all us older athletes is the loss of muscle. It makes us less strong, which makes us less able to maintain stability in key movements, which makes us more prone to injury. There is simply nothing more important than maintaining strength. In my case, having spent so much time out of the game, it’s important not just to maintain, but to build strength. As I have done so, I have found my performance numbers getting better. The first four weeks of this cycle the work on the track will be done consistently at 80%, enough to work me into condition and, at the same time, not so fast that I cannot concentrate on ingraining the correct body mechanics into my sprinting. I am well past the idea that slow running of any kind does any good at all; all it does for me, and for most people, is pound the joints and develop overuse strains. Judicious sprint intervals, on the other hand, condition as well as work the mechanics. I plan to start with two sets of 3 x 300 meters at 80%, with rests of 3 minutes between reps and 8 minutes between sets. I’ve found this to be a good level of challenge. That’s the Tuesday work. Then on Sundays I will get in quality sprint mechanics work, beginning with 5 reps of 60 meters, two sets, again with 3 and 8 minutes as recovery. 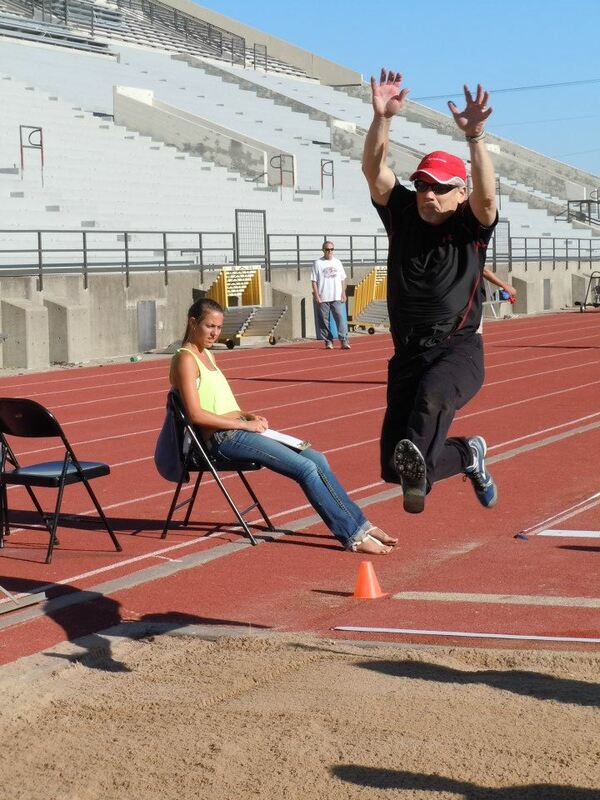 These also are done at 80% in order to concentrate on good sprint mechanics. The last two weeks of the cycle, before the meets on the 10th and 11th of February, changes the sprint protocol. The conditioning work on Tuesday becomes 200 meter repeats. The first bout of this is a killer: 8 x 200 meters at 45 seconds, recovery of 3 minutes. We will work down from that on a weekly basis. For these two weeks, I shift the Sunday session to Thursday, and up the intensity to 90%, trying to keep the good mechanics I’ve been working on. The principles I’m following here are ones that I’ve developed over the last 7-8 years. But I’m learning continually, and have no doubt that I’ll amend my activities as I go. For instance, I’ve found generally that I benefit from having my squat day buffered on each side by an off day. I’m letting that go for the last two weeks of the cycle so that I get two days of rest after squats and sprints. I have also found that I do much better if I perform mobility work on my off days, but that comes and goes with my work schedule and life balance. I need to make it more a priority. I’m also going much cleaner, diet-wise, in this last six weeks. That means I’m cutting sugars and alcohols, and generally trying to hydrate more consciously. My holiday regimen has bulked up on fats, so that needs to get cleaned up as well.